I love the idea of this book. Kathi's other books that I've seen have been great jumpstarts. And if the article below is any indication, then this book is a great way to discover a dream or put some feet to the dream. Be sure to leave a comment if you would like to be included in a chance for a Starbucks basket the author is giving away to one person who comments during the tour. Is there a dream that God has given you, but you are waiting until the kids are grown and you have money in the bank before you get started? You may not be able to enroll in a month long pastry making class or take a week off of work to get started on your novel, but today you can take three little baby steps to making your dream a day-to-day reality. It’s a little scary to tell the world what you want to do when you grow up—but this is one little step could get you closer to living your dream than almost any other. Plus—it takes very little time and you don’t have to raid your kid’s college fund to make it happen. When you gather up all your courage and tell your best friend, “I want to learn how to paint,” suddenly she remembers an old art book she has laying around she would love to give you, or her friend from church who teaches art classes. The people you know and love want to be a resource. Give them the privilege of being a part of making your dream happen. This is one of the simplest—and cheapest—ways to start exploring your passion. Find out who else is talking about restoring antiques and listen to their conversation. Start by Googling your interest along with the term “online groups.” You will be amazed with the number of people who want to talk about the proper way to care for 1950’s lunchboxes as much as you do. I remember the first time I put an offer in on a house—I wanted it more than I had wanted almost anything else in my life. While I knew that I had dozens of other people praying on my behalf, I was too scared to pray. I didn’t want God to tell me no. I was afraid to pray until my co-worker Kim asked me (in a loving, kind way), why I didn’t believe that God wanted His best for me. Don’t be afraid to pray—as with anything amazing in my life, the path is never what I expected, but it has always been obvious that God’s hand has been on it the whole way. 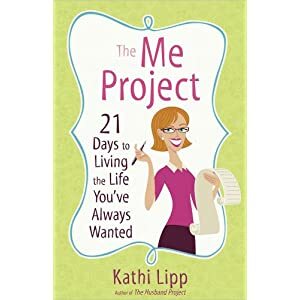 Kathi Lipp is a busy conference and retreat speaker, currently speaking each year to thousands of women throughout the United States. She is the author of The Husband Project and The Marriage Project, serves as food writer for Nickelodeon, and has had articles published in several magazines, including Today’s Christian Woman and Discipleship Journal. Kathi and her husband, Roger, live in California and are the parents of four teenagers and young adults. For more information visit her website: www.kathilipp.com. Thanks for sharing Cara! I hope you enjoy the book!